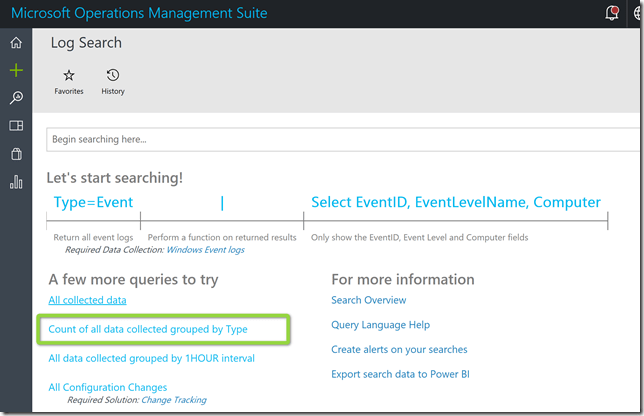 I believe that the Microsoft Operations Management Suite is yet another example of how cool Cloud based solutions can be. Instead of first having to spin up an entire backend infrastructure before you can actually start collecting data, with the Microsoft Operations Management Suite you can directly start focusing on the task of collecting and visualizing your data. 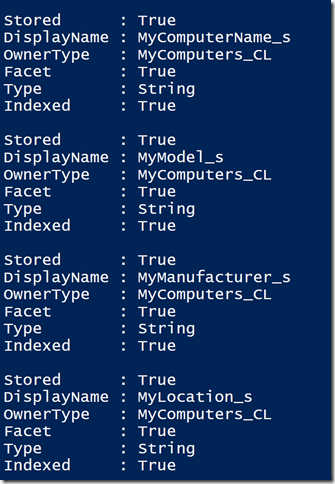 This blog post is basically a summary of my notes and scripts that I created while exploring the OMS Log Analytics HTTP Data Collector API, that allows you to submit any type of data to an OMS Workspace. 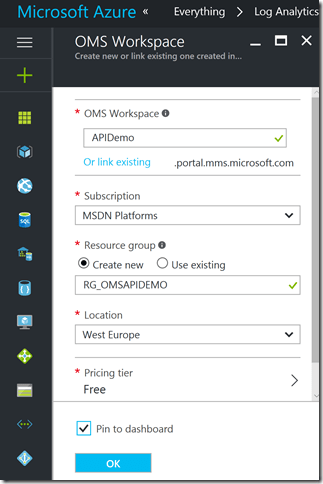 First we create an OMS Workspace. Within the Azure Management portal. 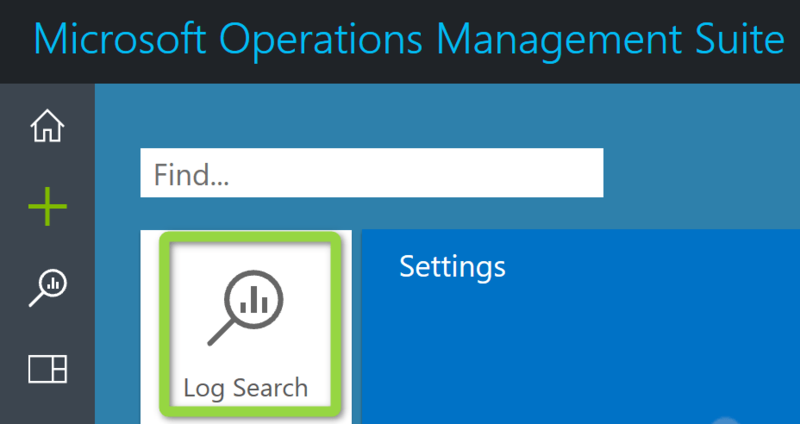 Select “New” search for Log Analytics and then create a new OMS Workspace. Once the provisioning process is completed, we have a new OMS Workspace. 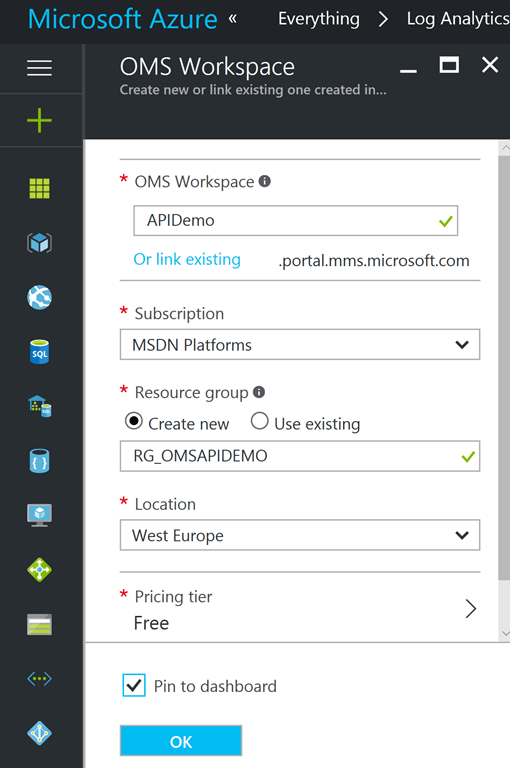 Clock on the “OMS Portal” button to access the portal. As a next step we define the LogType and the TimeStampField reference. The LogType is the name of our custom log that will be created. The TimeStampField is a reference to the Field that contains the date-time stamp. (For more details look at the Request Headers section). 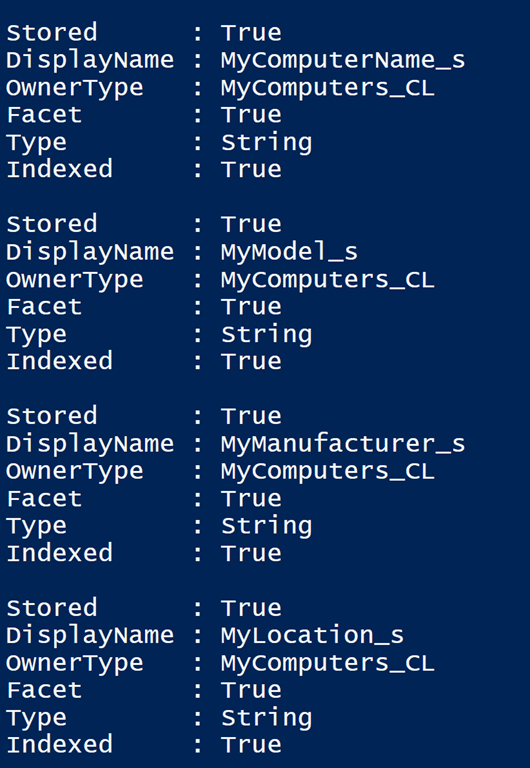 # Specify the name of the record type that you'll be creating $LogType = "MyComputers" # Specify a field with the created time for the records $TimeStampField = "DateValue"
And finally the code to submit the data to OMS, The Build-Signature and Post-OMSData functions originate from example provided by Microsoft. 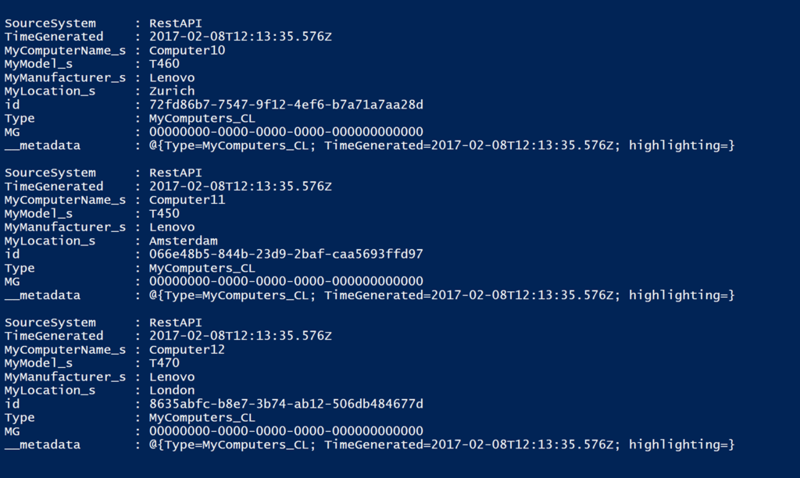 $uri = "https://" + $customerId + ".ods.opinsights.azure.com" + $resource + "?api-version=2016-04-01"
When submitting data for the first time to OMS, the log analytics schema is extended with the custom fields defined within the json object. I wrote a little helper function that retrieves the Log Analytics schema information. The Get-OMSSchemaInfo cmdlet can be downloaded from here. Okay, so far so good, we have submitted data, the schema has been extended and we can see the data we submitted to OMS. Now let’s head over to the OMS portal. 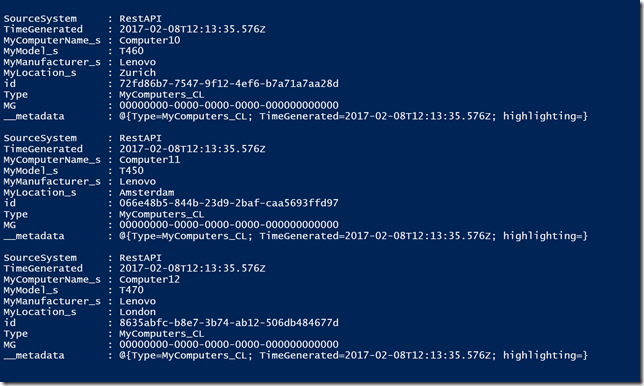 Note: Should you not see the full data but only the TimeGenerated information close all browser windows and open the OMS portal again. (Thanks to Cameron Fuller for the tip). 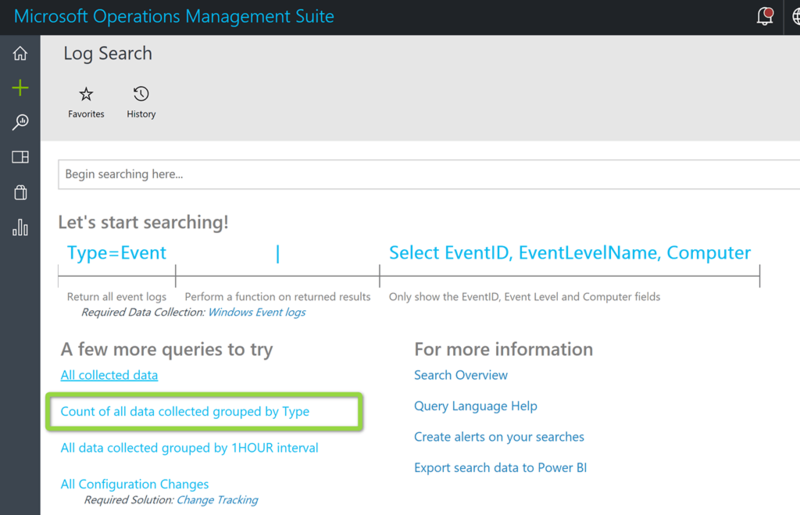 You can also see the new created custom fields within the OMS Portal via Settings, Data, Custom Fields. In a next blog post, I’ll walk us through the creation of an OMS Dashboard. Hope you found this useful. Copyright © 2019 Anything about IT. All Rights Reserved.